It All Started with Twine? 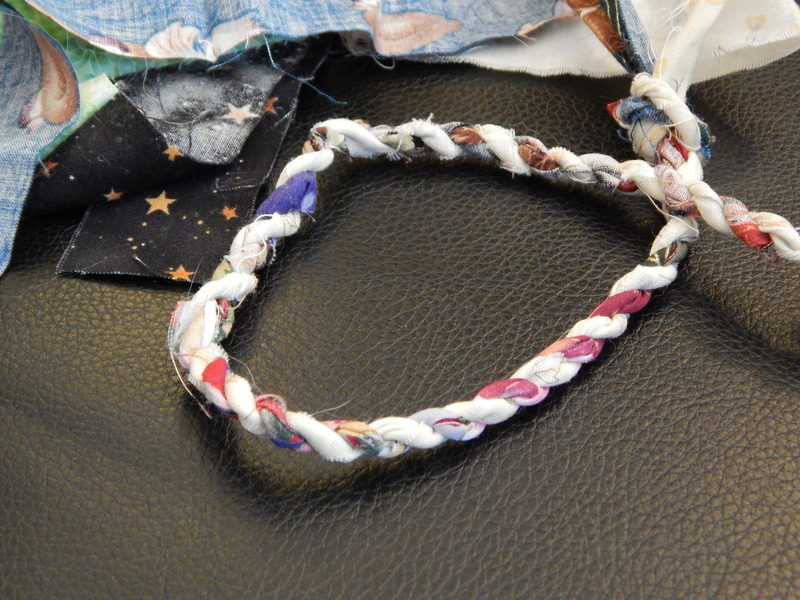 So has everyone seen the fabric twine? It must be on Pinterest, because it is so cute. 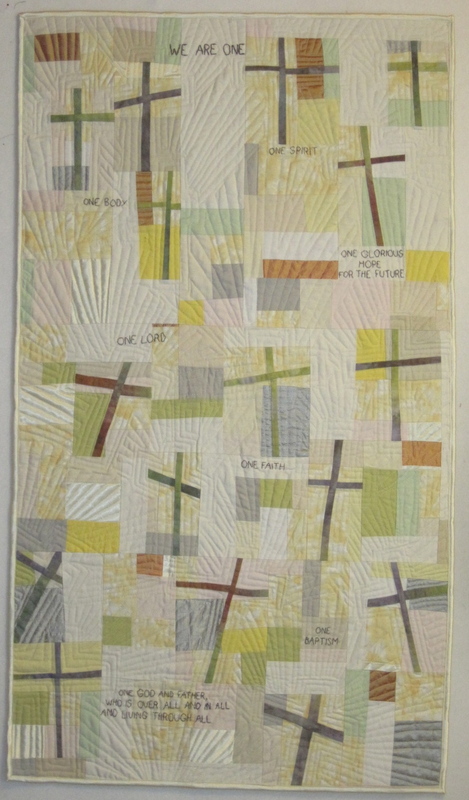 I saw it on The Quilt Show website. The first time I saw it I thought, Ooh, pretty! But the second time I saw it I was hooked. They used it to make a little rug! So I clicked over to the tutorial. I needed strips of fabric. I do believe I have a box of strips somewhere. I found the box of strips, and soon I was MAKING TWINE. Now, to be fair, she did warn that it was a little hard on the hands. Oh yeah. That twisting motion was very hard on my hands. I made this much, and knew that twine making was not in my future. That made me a little mad, so I went back to the box of strips. There were plenty in there. 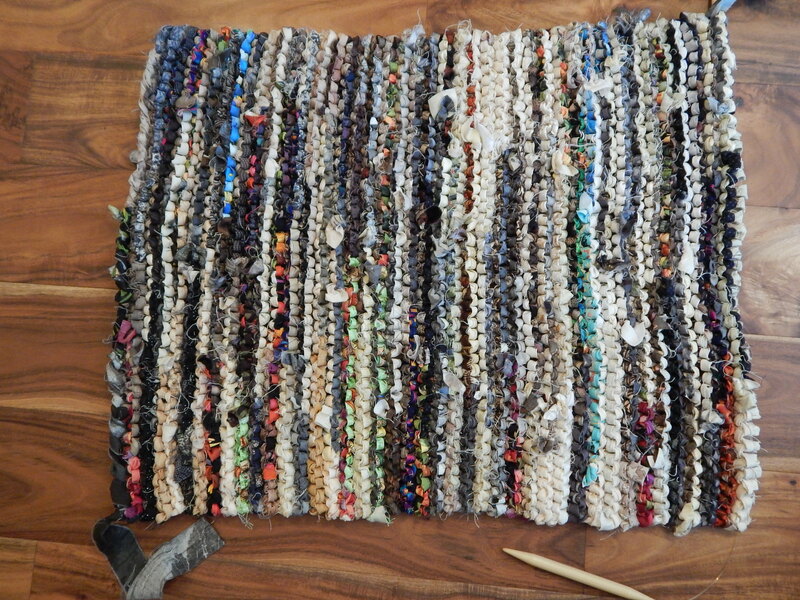 I could make another knitted rug. I really do like these rugs. I have two in my kitchen, and they are nice and cushy to stand on. Plus, they are easy to wash. And free. 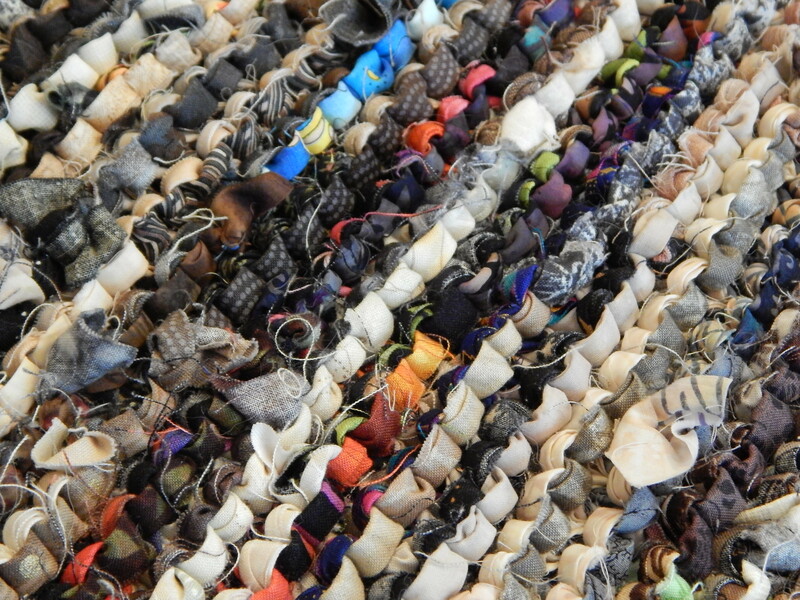 And they use up a lot of fabric that I would otherwise be donating to the thrift store. Okay, so I got that rug started. The strips in the box were mostly neutrals, both darks and lights. I liked that idea, and decided to add just a few sparks of color once in a while. So about a week later I went into the studio with the intention of cleaning up. There were still some strips leftover in that box. I was thinking I would just toss them. I made the mistake of actually LOOKING into the box. 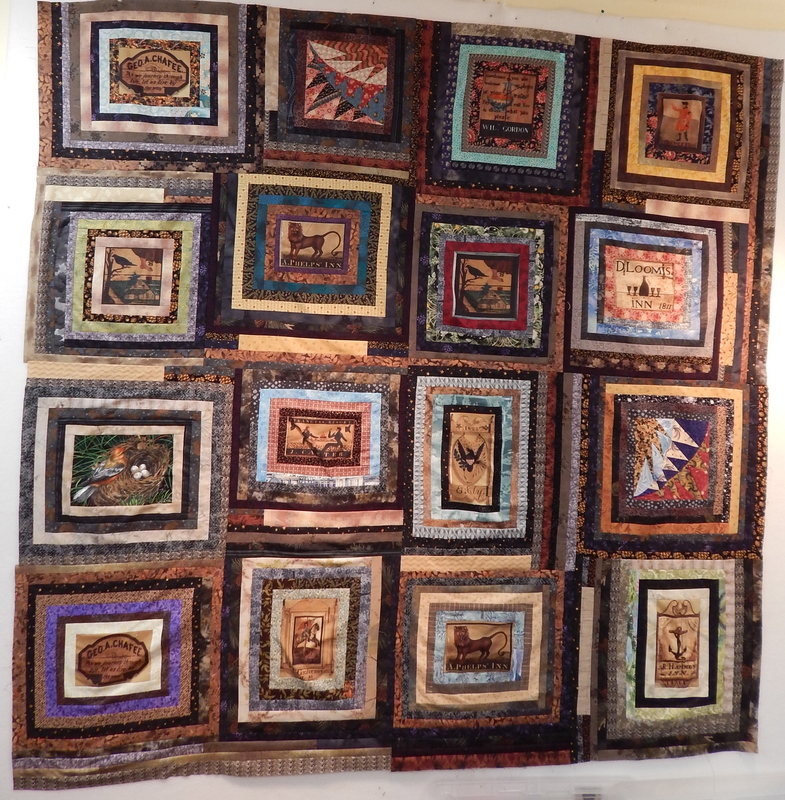 There were three squares that I had started on a few years ago. They were from a fabric panel that had old inn signs on it. I really did like those signs, and I liked the way I had outlined them with the strips. 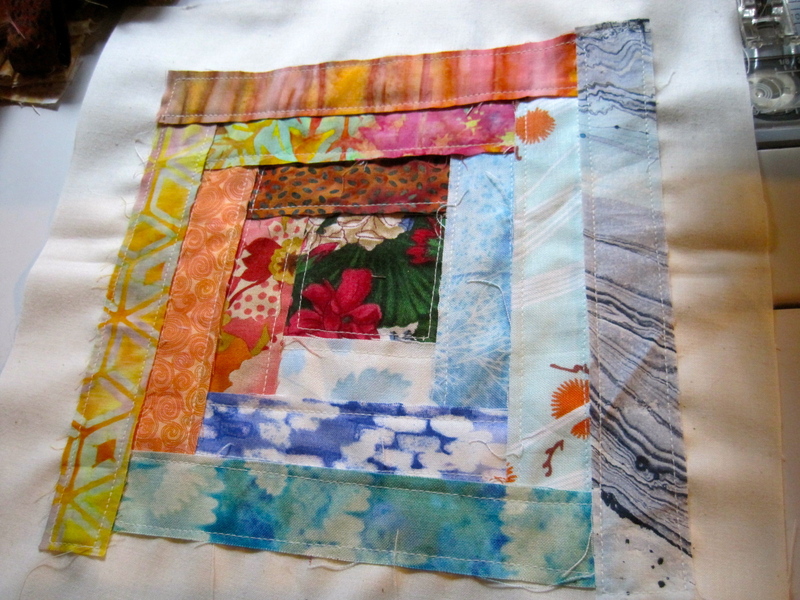 Oh, plus, for some reason, there were two paper-pieced blocks in there. Maybe I should use these strips up and make a little quilt. 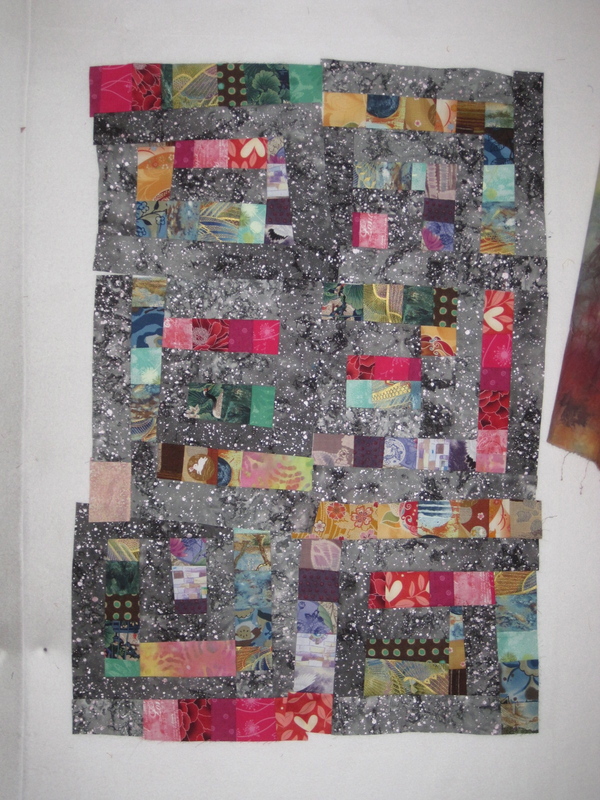 ONE WEEK LATER, (and of course, with lots more strips cut out) I finished another WAY TOO BIG quilt top. 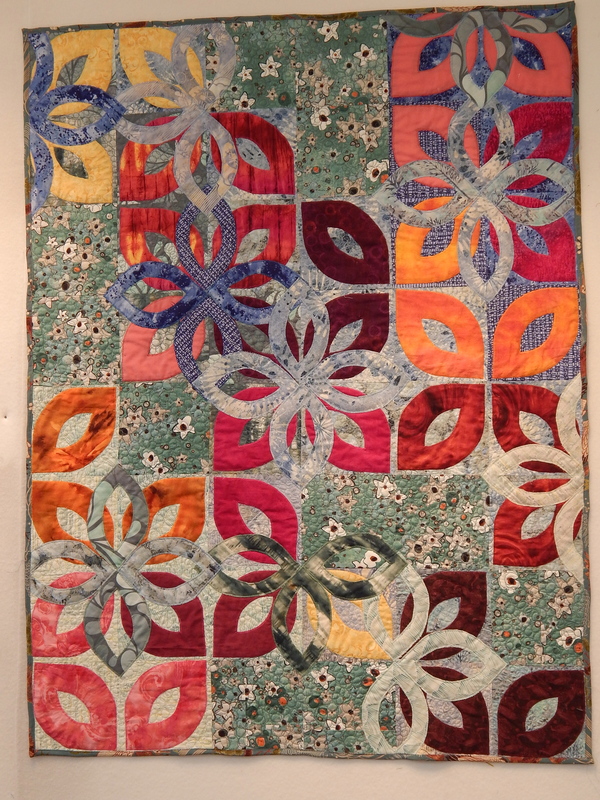 It was very fun to work on this quilt, and it was a nice break from using my hands so much (machine piecing instead of hand work.) But 72″ X 72″? 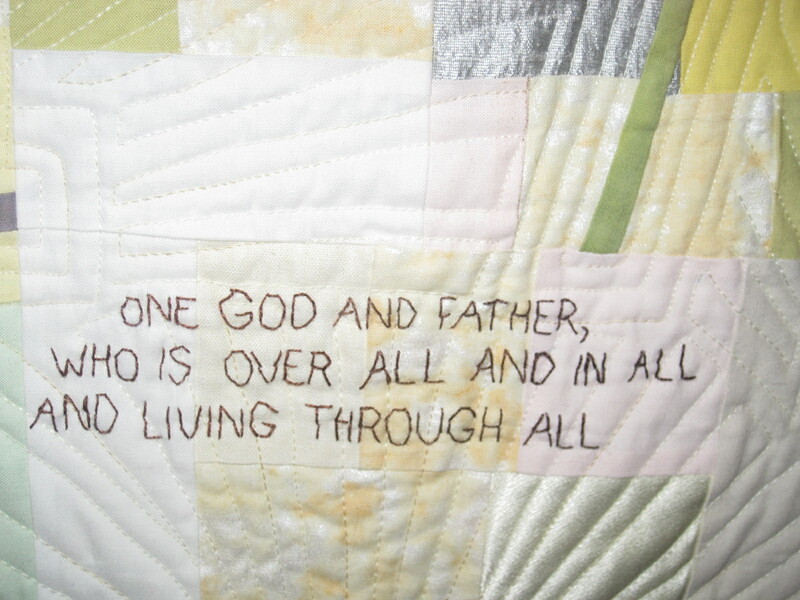 That’s gonna be a lot of dang quilting. 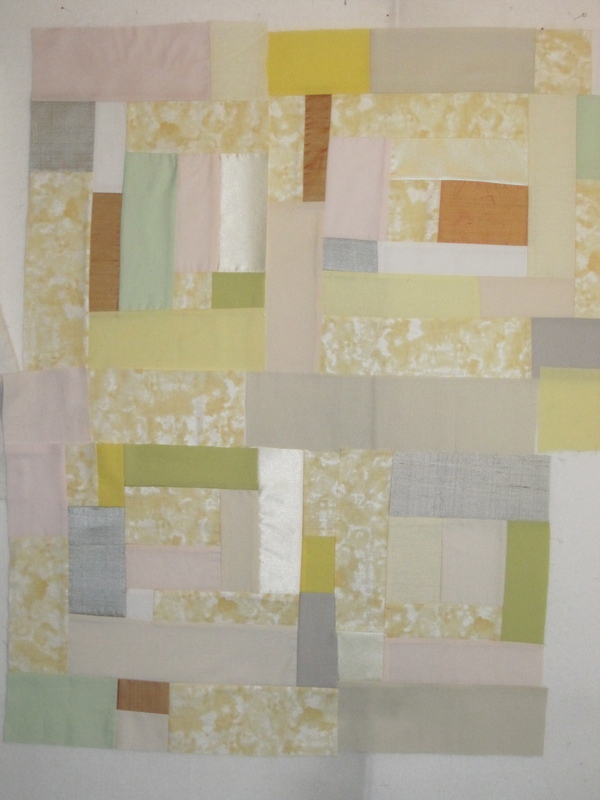 Remember this quilt that I started way back when? And then I got the top put together here? I mentioned in that post that I was considering adding perle cotton embroidery to the ovals. And sure enough, I did do that. 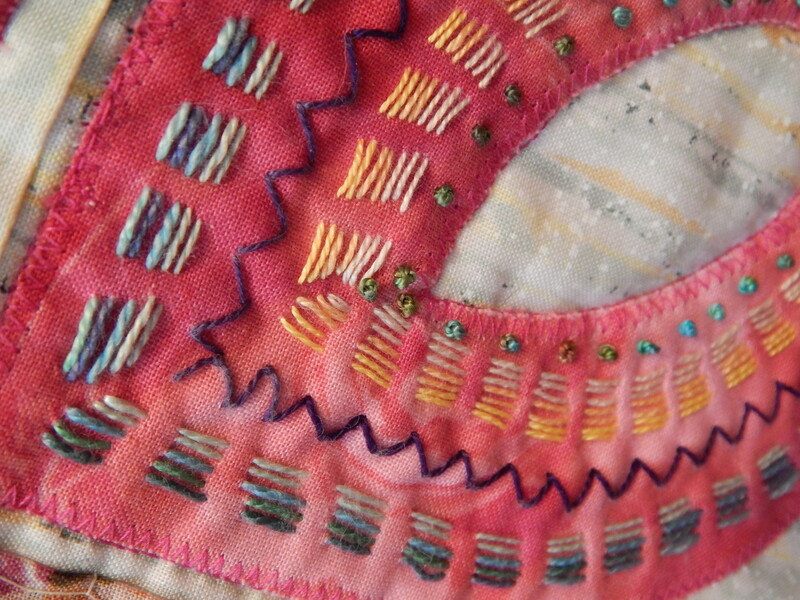 I thoroughly enjoyed just adding my simple random embroidery to those pieces. But after I had finished six of them, I still didn’t like the way it looked. I tried again, using only the running stitch, and connecting the ovals. Nope, I didn’t like that either. So I took all that embroidery out. 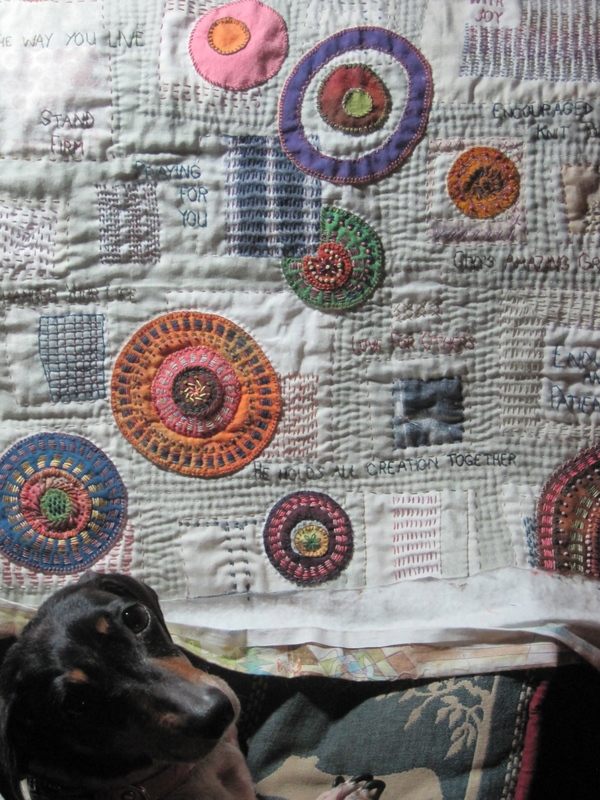 And then I tried to figure out what I was going to do with this quilt. 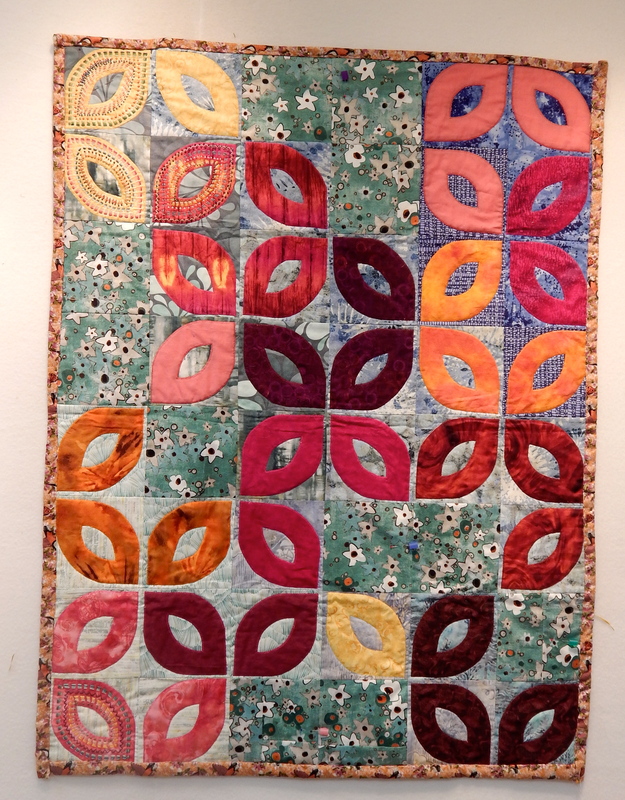 It was on the wall when I took out some little oval pieces to play with on a different quilt top. 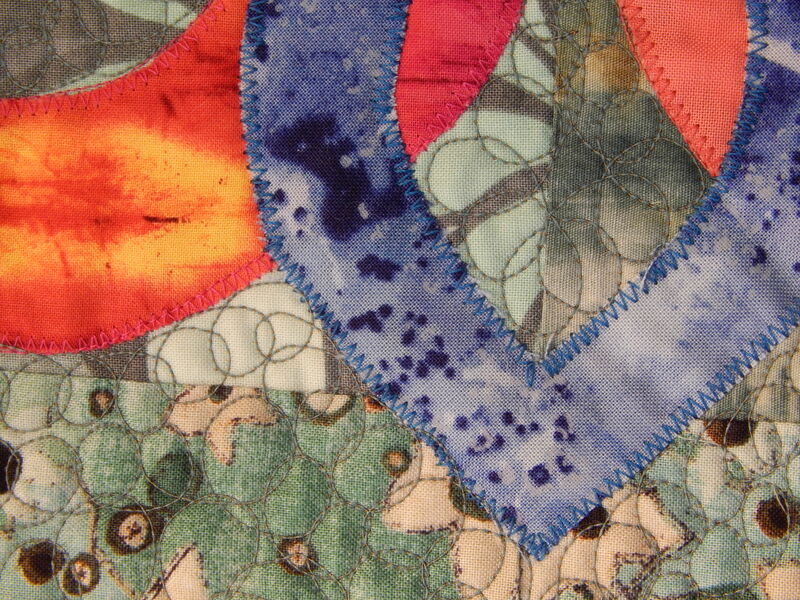 When I do my zig zag appliqué, I often cut the back out carefully and keep those pieces for a future project. 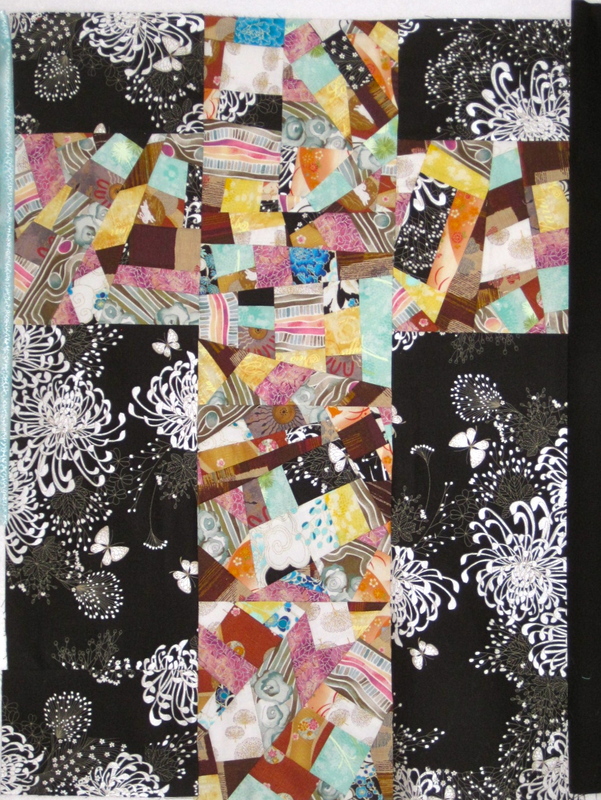 So these were the leftover pieces from this particular quilt. And I thought, Hey….. So I tried putting these ovals on top of the other ovals. And I liked it! 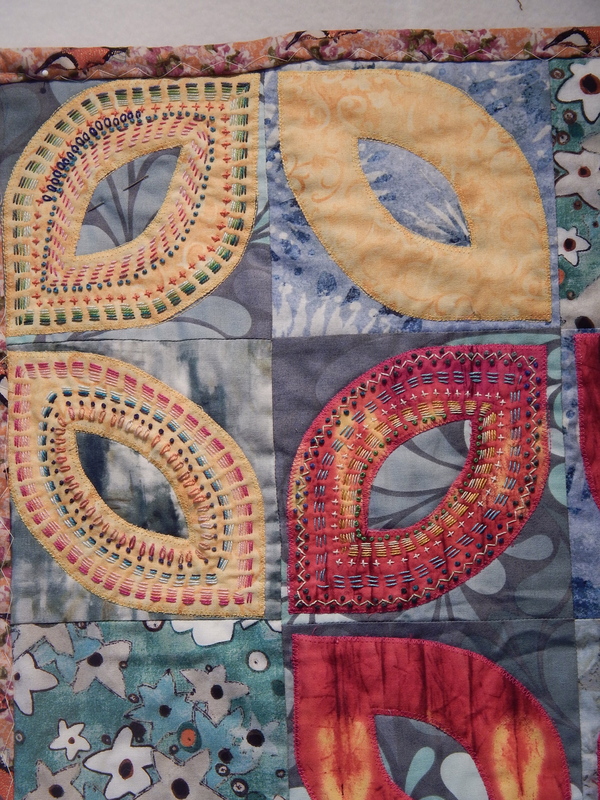 Since the quilt sandwich had already been made and partially quilted, these motifs were zigzagged through all three layers of the quilt. 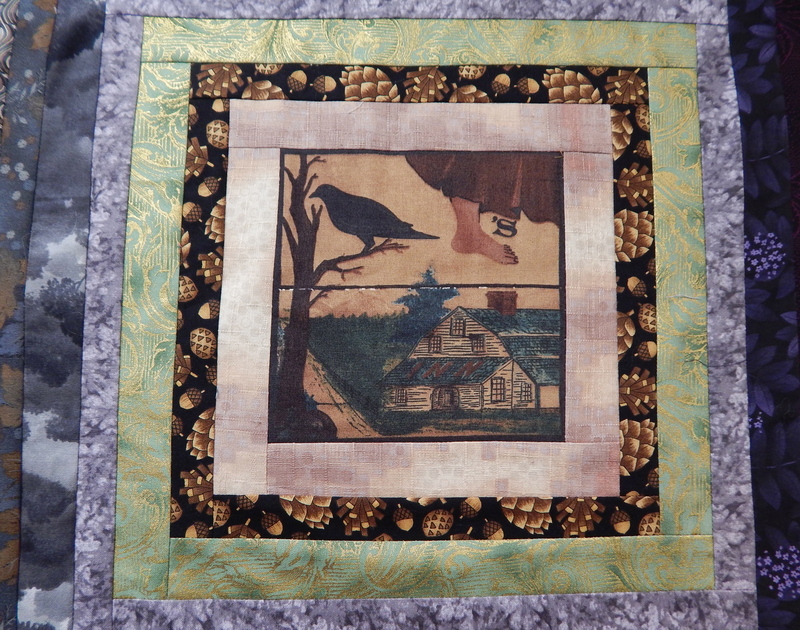 I finished it with some “scribble circle” quilting. P.S. 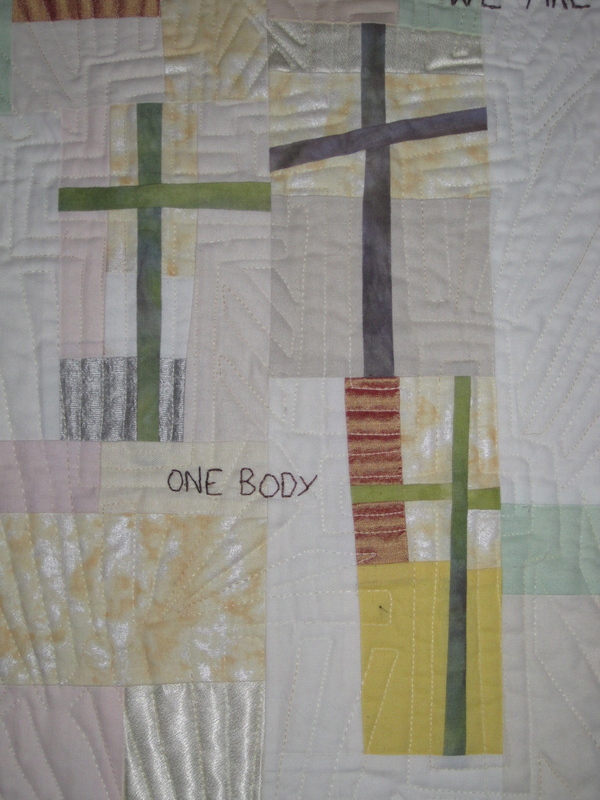 I realize that those pieces are not “ovals.” But I don’t know what to call them. My BF says it looks like a Fleur de Lis now. I think that name will stick!